Linear: The more of the better. Delighters: Even a small number of these features can raise the customer satisfaction significantly to new levels. Unimportant: They make no difference, should be exclude from the product. Undesired: Customers are turned off by these features, they must be excluded. If the product could do feature X how do you feel? If the product could not do feature X how do you feel? Looking at the distribution of the answers, it is possible to conclude on the impact a certain feature has on customer satisfaction. If the answers are evenly distributed between two or more Kano types, this could be an indication that the product should be made available into different flavors (e.g. “standard” and “professional”) to better meet the needs of different customer types. 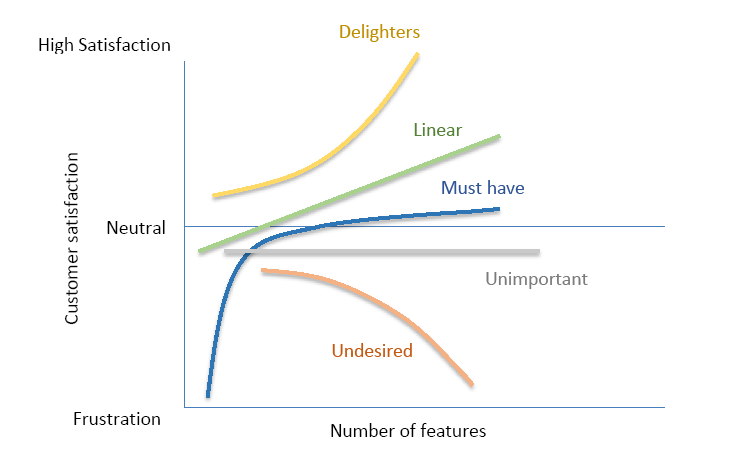 Teams should focus the development efforts on the “Must Have”, “Linear” and “Delighter” features in that order. The MVP product should be based on the “Must Have” features. However, even though the “Must Have” features are required for the product to survive, they do not have to be fully implemented from the beginning. In many cases a reduced version of the “Must Have” feature may also be adequate. The full feature can be planned for a later release. The “Linear” and “Delighters” should be planned for a later release. A final important note: The impact a certain feature has on customer satisfaction is not constant and it may decrease with time. For example “Delighters” may degrade to “Linear”and “Must-have” even to “Undesired”.